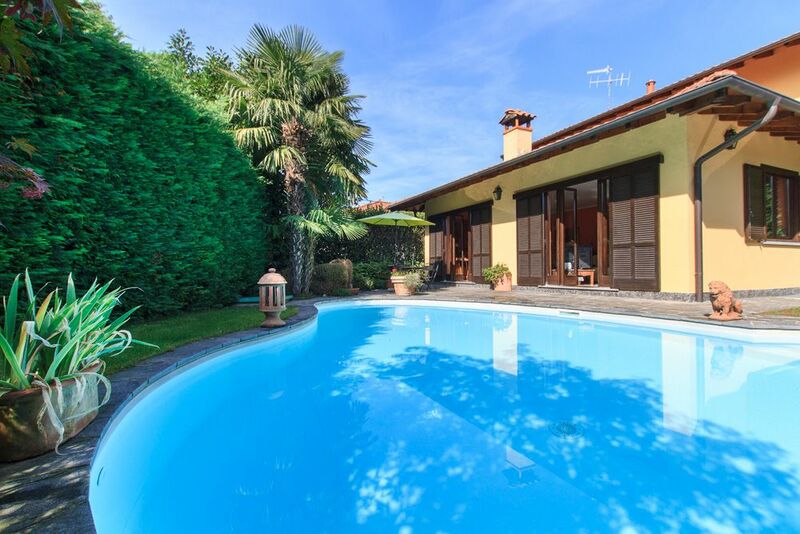 Enchanting villa with private swimming pool located in a quiet, well-established residential area, close to Lake Maggiore and the city of Intra Verbania, Italy. - On the ground floor you’ll enter a spacious living room with comfortable couches and TV, elegant dining table, piano and open fire place. Fully-equipped kitchen. There is also a double bedroom and bathroom with whirlpool bathtub. - The first floor comprises a bedroom with double bed, a bedroom with 2 single beds (can be joined together) and a bathroom with shower. - Two extra single beds can be added (one in each double bedroom) upon request. Large French doors in the living room open out onto the charming private garden and swimming pool (12x7m) with deck chairs and sun loungers. The gazebo with stone dining table and barbecue is ideal for dining and living ‘al fresco’ during the warm summer evenings. The garden is completely fenced and pets are allowed. Within walking distance (100m) you'll find a restaurant, kids playground and football pitch. The villa is situated near Intra Verbania (2 km), a lively town with many shops, bars, restaurants and a weekend market. You can stroll along the beautiful lakefront promenade, hop on one of the many ferries to discover the secrets and wonders of Lake Maggiore. In the nearby mountain valleys a range of leisure activities and sports (hiking, mountain biking) are offered. - Swimming pool open from May to September; contact us for the exact dates. - The owner is living in an apartment under the house but has a separate entrance and will not interfere at all with your stay: the house, garden and swimming pool are for your private use only. Lovely villa in great location. The accommodation, whilst situated in a residential area, is very private and gives the impression of seclusion. It is very well equipped and comfortable with the added bonus of a pool and lovely external bbq and dining area. The gardens are well maintained and the owner whilst living below is very private and respects your privacy. The region is superb. Verbania allows easy access to Stresa where you can get easy access to Milan via train, the Glacier Express and boat trips as well as the northern area of the lake - Locarno and Ascona (remember your passports though as the top end is in Switzerland!). There are some lovely little towns to visit and a trip to Lake Orta is worth the short drive too. There are plenty of good resturants and supermarkets provide all you need for a self catering break. Parking is at a premium in Stresa and Verbania. The booking process was very simple though the bank transfers can be problemtic and expensive but this is because of the banking systems not the company, however if you shop around you can find easy and cheap ways of transferring the deposit and balance. NorthItaly.eu were very prompt and helpful in responding to a number of queries we had. Non c'è dubbio, abbiamo trascorso una vacanza splendida...anche se il tempo non è stato molto favorevole. La casa è bellissima e anche la piscina ,ancora più belle che in foto .Tutto molto pulito e attrezzato e la proprietaria molto molto discreta ,disponibile,gentilissima e simpaticissima...proprio una bella persona .Nonostante il tempo abbiamo fatto delle gradevoli passeggiate sul lago che è molto vicino alla villa . La sig.ra ci ha anche indicato vari posti dove poter pranzare o cenare,nei quali ci siamo trovati benissimo .IL nostro cane ha gradito molto lo spazioso giardino. Se dovessi dare un voto alla vacanza ,darei sicuramente un 10 ! Un 10 anche alla NorthItaly che ha risposto prontamente a tutte le nostre domande e ha organizzato il tutto perfettamente. 1. The accomodation is excellent and satisfied all our needs for 6 grown ups, the advert does not really do it justice. The property is clean and well maintained especially the garden and the pool. The owner lives on site but does not worry you and is very helpful. The only minor observation was that the pillows were very hard and uncomfortable. 2. The region is ok, quite a walk to the town, about half an hour, and always had to get a taxi back as it was up a steep hill, this was expensive, particularly with some drivers!!! A good range of restaurants are available in the town, there were however no local shops so had to use supermarket in town for stocking up. Also the location of the villa was sometimes noisy with dogs barking and road noise. Boat trip to Stresa and Isola Bella highly recommended, very disappointed that no evening ferries run as it would have been nice to go to Stresa for an evening but this was not possible. Hiring a car is highly recommended. 3. Booking process through NorthItaly.eu was excellent, however more travel information would have been helpful particularly regarding bus links from the airport using Alibus, ferry times etc. Die Vermieterin ist sehr nett und hilfsbereit, sie gibt wertvolle Tipps, was Restaurants, Strände und Ausflugsmöglichkeiten etc anbelangt. Es war sauber und gepflegt. Nachts war es recht ruhig. Wir bekamen immer einen Parkplatz vor derm Haus. Die häusliche Ausstattung ließ etwas zu wünschen übrig. Gewünscht hätte ich mir einen Wäscheständer zum Aufhängen. Auch ist keine Kaffeemaschine im Haus. Es ist langwierig mit dem Gasherd zu kochen. Das Badezimmer im Erdgeschoss hat eine Badewanne , aber keinen Duschvorhang, womit das Duschen schwierig wird. Den Pool haben wir gar nicht benutzt, weil er nicht einladend zum Baden war. This gorgeous holiday villa is situated only 1 km from Lake Maggiore - 5 minutes by car or a pleasant 15 minute walk down the hill allowing you to admire the view on the way. Within walking distance (100m) you'll find a restaurant, kids playground and football field. Intra Verbania (2 km) is a lively town with many shops, bars, restaurants and a weekend market. You can stroll along the beautiful lakefront promenade, hop on one of the many ferries to discover the secrets and wonders of the lake. In the nearby mountain valleys a range of leisure activities and sports (hiking, mountain biking) are offered. Price per week (6 people) Price for extra single bed (max 8 people): upon request Included: Water, electricity, gas, bed linen, satellite TV, DVD, wireless internet, washing machine, dishwasher, baby bed and high chair, garden, barbecue, swimming pool (12x7m, max depth 1,5m) Extra to be paid cash upon arrival: - Security deposit (refundable): 400 euro - Final cleaning (obligatory): 75 euro - Bathroom towels (upon request): 10 euro per person - Heating: 20 euro per day - Tourist tax: to check upon arrival if applicable - Domestic animals allowed (upon prior request only) Arrival and departure: Reservations by week (from June to September) Reservations minimum 2 nights (from October to May) Note: - Swimming pool open from May to September; contact us for the exact dates. - The owner is living in an apartment under the house but has a separate entrance and will not interfere at all with your stay: the house, garden and swimming pool are for your private use only.